I was so incredibly happy to hear about this story I just had to share. As I’ve mentioned before, we are trying to clean up our eating habits including avoiding processed foods and GMOs. Unfortunately, as I’ve been shopping for Easter candy that’s about all I’ve been finding. That is, until UNREAL’s unjunked Candy was brought to my attention. Thanks to UNREAL I will be receiving some of this yummy candy for my family to enjoy this Easter and the kids won’t be looking at candyless baskets! Easter is right around the corner and this year, the Easter Bunny has had the same epiphany we have! He realizes that he has been a bad, bad bunny – not reading the labels on the candy that he’s been putting in baskets. He had no idea there were things like preservatives and artificial colors in them. However, this year he is changing his ways and is asking others to join in his movement to unjunk candy. The Easter Bunny today announced that he has been a bad, bad bunny and issued a formal apology for the candy he’s been putting in baskets. He admits he never read the labels and was shocked to learn about all the artificial ingredients, corn syrup, preservatives and other junk in the candy that he’s been handing out each spring. The Bunny recognizes it’s a problem and as a result, he has announced that he will be changing his ways. The Easter Bunny hopes everyone will join in his movement to unjunk candy – including all of the candy companies. As a way to make amends, he set out to find a way that people everywhere could still enjoy candy, without the junk, with less sugar, and more nutrition. The good news is that he found it. Leading up to the holiday, the Easter Bunny and thousands of his friends and family will be issuing personal apologies. Some of the Easter Bunny’s many celebrity friends, like John Legend, Jillian Michaels , and Tom Brady , are supporting his movement to make amends. The Easter Bunny will also be handing out UNREAL – the unjunked candy. To show its appreciation for the Easter Bunny’s support, UNREAL has agreed to be the proud sponsor of the 2013 Easter Bunny Apology Tour. The Bunny invites all candy companies to unjunk their candy and join as sponsors of his future tours. 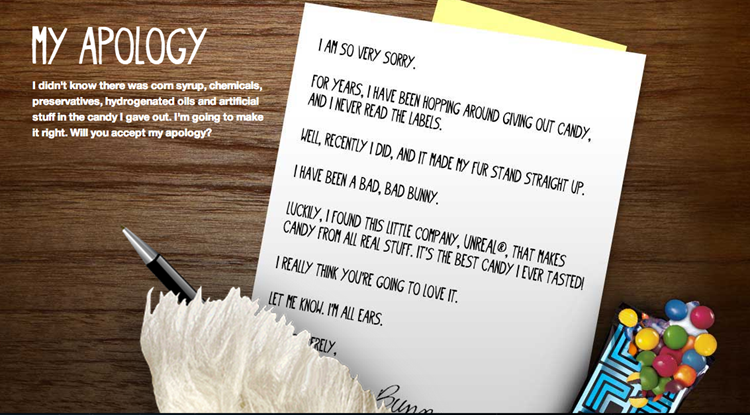 For the latest updates on the 2013 Easter Bunny Apology Tour, visit www.sorrybunny.com and follow @thesorrybunny on Twitter. UNREAL Candies can be purchased in many stores including Target, CVS, Walgreens and Kroger. Retail prices range from $.89 to $1.29 for individual bars and $4.99 for the family sized bags. Rules:You do not have to be a blogger to enter/win. An email address is required to enter. The winner will be chosen randomly through Rafflecopter and contacted via email. A reply to the winning email is required within 48 hours before a new winner is chosen. One person entering per household please. US ONLY please. This giveaway ends at 11:59 PM EST on April 12, 2013. I liked the video of the Easter Bunny trying yoga and I earned that UNREAL Candies are made without chemicals, artificial stuff, preservatives, corn syrup, hydrogenated oils or GMOs. I love that jillian michaels is one of the celebrity friends! I would love to try the UnReal Peanut Butter Cups. Mmmm! I like the celeb friend’s videos, especially the one with John Legend. I have decided to cut dyes out of my youngest sons diet and so I found these at Target and am excited to try them. No chemicals, artificial stuff, preservatives, corn syrup, hydrogenated oils or GMOs. I want to try the peanut butter cups. I liked seeing the Easter bunny trying to do yoga. I love candy. Now, to have new ones to try that are made better is wonderful! Poor bunny realizing the junk he gave our kids. Now if the food companies will realize it too and change! I want to try the peanut butter cups! LOVE the blog and all his celebrity friends! I love the Jillian Michaels video! Too cute. I like the Unreal peanut butter cups they sound yummy! I like that there is no chemicals, artificial stuff, preservatives, corn syrup, hydrogenated oils or GMOs. I’d love to try the peanut butter cups. loved Jillian motivating the Easter Bunny – she is so tough. and who knew the Easter Bunny had 36,402 siblings? I like the celebrity videos! I like how good they are for you! I learned the candy has no chemicals, artificial stuff, preservatives, corn syrup, hydrogenated oils or GMOs. I would love to try the Carmel Nougat Bar. Sounds so yummy! I like that the site lets you know where to buy these candies. I really want to try the peanut butter cups! I’d like to try the Chocolate Caramel Peanut Nougat Bar. i LOVE the vid of Tom Brady playing catch with the Easter Bunny! hilarious! I like that there is no corn syrup in their candy. I love the Celeb Friends videos. Too cute! I like the Jillian micheals video. I have tried this candy , and it’s ok. This stuff is quite good. I do like their promotions. I just love the idea that there’s nothing artificial about the candy. I love that Unreal candy has no corn syrup in it. Corn Syrup gives me migraines so it limits the candy I can eat greatly. I can’t wait to try these. I am so excited to try the Unreal peanut butter cups! Like that it is made without chemicals, artificial stuff, or preservatives. Visited and I like the About Me section, hilarious! I think its great that their making candy of all thing healthier to eat i know ill be making the change be able to indulge now and then and not have all that bad stuff when i do. I like that they use real cane sugar. That is so cute! And unfortunately, so true……our foods are loaded with chemicals. I love their varieties! All my faves! I think the Candy Coated Chocolate Peanuts look amazing! I enjoyed the Jillian Michaels video on their site! this candy is definitely great! i tried it. i learned on the website that this candy had no chemicals, artificial stuff, preservatives, corn syrup, hydrogenated oils or GMOs. I love how the bunny has 36,402 brothers and sisters. Just reading that made me smile! I like the whole campaign in general, I thought it was really cute. I learned that It’s made from all real stuff, like real cane sugar, real caramel and nougat. I’d like to try the peanut butter cups. i would like the peanut butter cups! 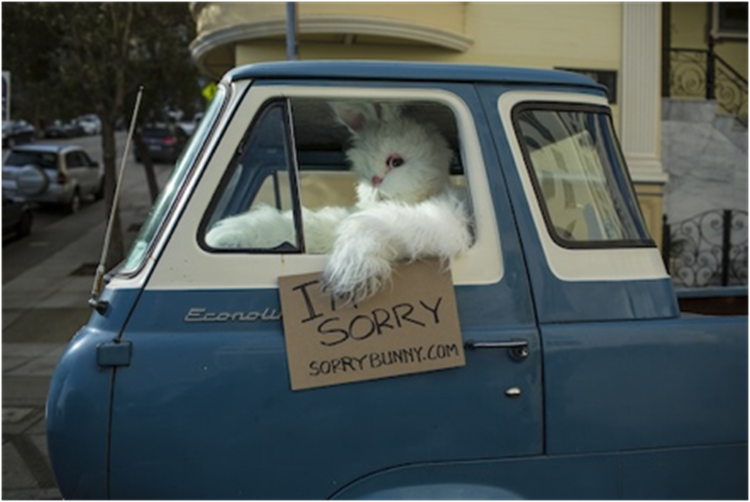 the sorry bunny easter bunny apology tour is hilarious! I like the idea of good candy !